Captain Hendrick Aupaumut (1757-1830) was a member of the Stockbridge Indian Tribe. As Historian, he translated the Catechism & Bible into the Indian language for his people. Enlisted in the Revolutionary War in Colonel Patterson's Regiment in 1885. Revolutionary War Hero, cited in various war department records, was presented with Captain's sword by George Washington himself. 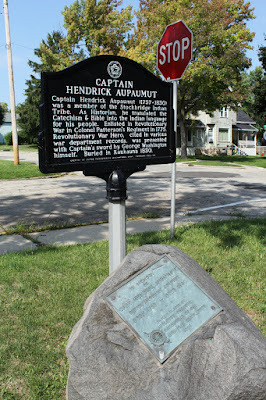 Buried in Kaukauna 1830.